I hope you always have a shell in your pocket and sand in your shoes. But if it cant be in your pocket we’ll settle for it round our wrist! 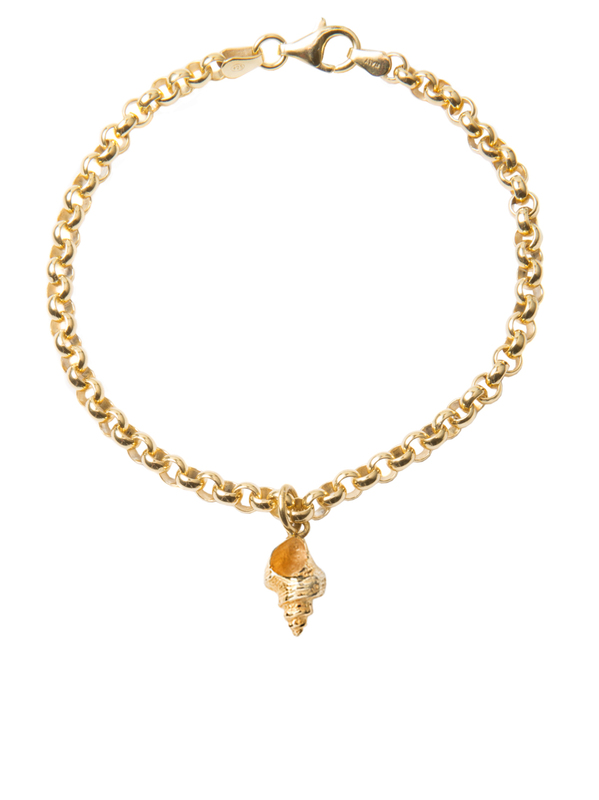 This gorgeous gold plated whelk shell measures just over 1.5cm in length and hangs on a sterling silver belcher chain that has been treated to a 23.5KT gold coating which is very permanent. The gold chain measures 0.4cm in width. Our signature t-bar on a delicate, solid sterling silver belcher chain. The link size and weight make this the perfect layering accompaniment to other much loved bracelets and bangles. T-bar measures 2.5cms wide and chain length is 19cms. Our signature T-bar on a gold plated belcher chain. The link size and weight make this the perfect layering accompaniment to other much loved bracelets and bangles. Its also an excellent addition if you have already got the T-Bar necklace. T-bar measures 2.5cms wide and chain length is 19cms. An amazingly elegant bangle that would sit well with other bangles or linked bracelets. One side opens so you can slide the bangle over your wrist. Hand made in bronze an plated in 2 microns of 18ct gold in Birmingham. The chic, fluidity of this solid sterling silver chain bracelet is due to the mix of circular and oval links, making is an easy-to-wear piece you won't want to take off. It measures 19cms in length, 0.7cms wide and 35grams in weight.